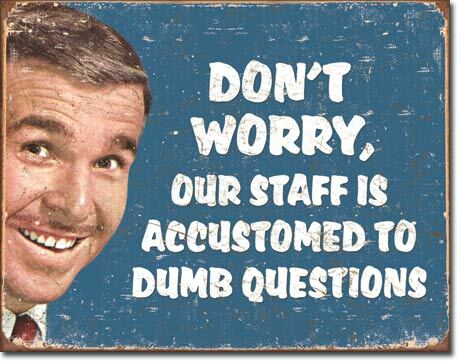 What they don’t do is designate a question as dumb or stupid, because that’s offensive, and scientists are frail like quails when it comes to their intellects. I have thought about that before, but I haven’t come up with an answer, and here’s why. I have thought about that before, and here’s the answer. I have already explained that, but I’m happy to go over it again. The answer is obvious, and I’m surprised you don’t know it. I welcome all of these myself, but there are also questions that can be designated “mean”, which I enjoy less. For example, when the person asking already knows the question and is just quizzing you (acceptable at a defense/exam). Or when asked in order to bolster oneself showing off how much they know, or to turn the discussion in a certain direction (the aging Prof’s pet area of study, typically), which is mean to the extent that it takes the focus off the speaker and the subject matter. Scientists, especially graduate students, are very afraid of asking dumb questions, but they shouldn’t be. First of all, if you ask one of the two kinds of dumb questions listed here, know that if you didn’t get it, most likely you’re not alone, and your peers will be grateful that you asked the question. On top of that, the speaker will often realize that maybe they shouldn’t have assumed that everyone knew the answer, and should have been more careful explaining it in the first place. But also, I have found that learning to embrace what might by some be seen as a stupid question crucially paves the way to understanding. The road to failure is paved with unasked questions, or something like that.